Remember that time Hollywood re-made that iconic film and no one was upset by it. Me neither. It feels a little silly to still be complaining about remakes, but it’s almost like the studio wanted to make “Robocop” fans instantly hate this film. Eventually I will move on to reviewing the 2014 film, but first I have to (briefly) explain what made the 1987 film memorable. If you don’t care, just move down two paragraphs. First, it presented a prophetic view of where technology and the infrastructure of cities like Detroit were headed. Second, it was one of the most violent films in mainstream American history, needing 12 different attempts to get the MPAA to grant it an R instead of an X-rating. Third, its satire of corporate life and America in general gave it a dark, humorous edge. So how does this re-imagining compare? Like a film from a completely different franchise. The action is entirely impersonal and bloodless. There is no sense of the city of Detroit as the film bounces from the Middle East to Detroit to Washington, D.C. to China and then back to Detroit. Part of what made Robocop necessary in the original was that Detroit was in ashes, but in this film it’s just another American city. The satire has been completely removed minus Samuel L. Jackson doing his best Bill O’Reilly impression throughout the film. What are we left with? A generic action flick with a cyborg. 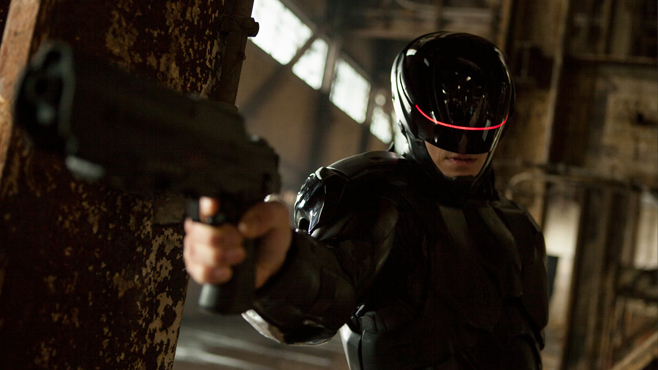 For those unfamiliar with the storyline, “Robocop” is the story of police officer Alex Murphy (Joel Kinnaman). Taken out by some criminals he’s pursuing, he’s left with roughly two appendages and little-to-no chance at surviving. In steps Omnicorp, seemingly the world leader in robotics, drone warfare, etc. who are having trouble assuring the American people that their machines can be trusted to keep the streets safe. Raymond Sellars (Michael Keaton), the CEO, decides that in order to give his machines a friendlier face they need to put a man into one of their drone bodies. The doctor (Gary Oldman) in charge of the project believes that in order for Robocop to be as productive as his inorganic counterparts, though, they would have to remove what’s left of his humanity. Thus begins the biggest quandary of the film. While it’s easy to compare certain things from this film to its 1987 inspiration, director Jose Padilha and first-time writer Joshua Zetumer at least tried to make this film its own entity by wiping out most of the characters from the original. Roughly the only characters to make the switch are Murphy, Lewis (now a male character played by Michael K. Williams) and Clara Murphy (Abbie Cornish), though in the original the latter didn’t have a name because she was only in one scene. Padilha is a Brazilian director known for his action film series “Elite Squad” and, though I wish he had a better American debut, does pretty well transferring his talents over to this film. The main two problems of the film are a weak script and the weight of the film’s predecessor dragging around. Despite these shortcomings and pressure from the studio for the film to secure a PG-13 rating, Padilha does what he can to string along a decent action flick. Although Joel Kinnaman is great on “The Killing”, it doesn’t feel like he did much to change his character from that to this cop role. Even though the filmmakers decided to give Robocop a visor that shows off more of the star’s face, they didn’t bother to make him particularly interesting. Instead they surrounded the star with a high-caliber supporting cast to make up the difference. Jackson and Jackie Earle Haley as the Omnicorp security expert Rick Mattox are easily the best thing about the film acting-wise, though it is nice to see Keaton and a not-so-annoying Jay Baruchel. What most people unfamiliar with the series will probably care about is the action sequences. After all, if enough things go boom maybe we can get over some of the other problems. There is enough action in the film to where it doesn’t lull, but there’s nothing new or all that interesting about the sequences. One shootout sticks out because it takes place in the dark with only muzzle fire lighting the scene. It’s kind of cool but I think “Smokin’ Aces” had a better idea keeping the effect shorter. “Robocop” isn’t a bad film, but much like the fourth installment of “Die Hard”, it feels like someone forgot what the film was supposed to be about. When a film loses its purpose like that, it feels like selling out whether or not that’s the case. With as bad as 2014 has been so far, though, you could do a lot worse than this remake.